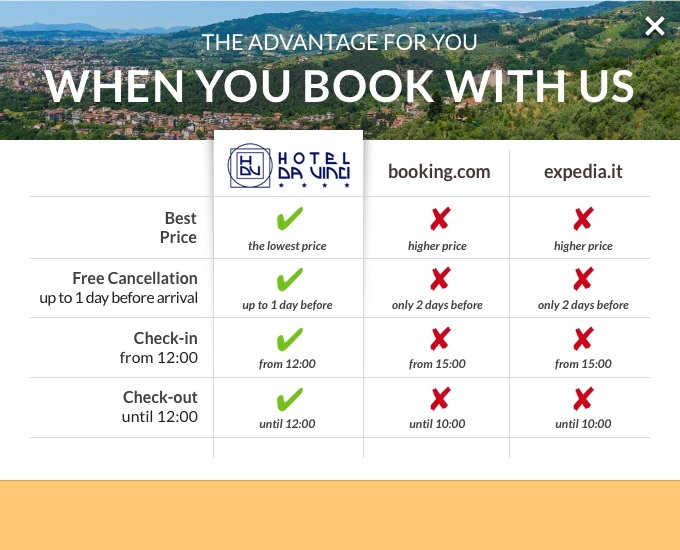 HERE where you are now, the official Hotel Da Vinci website, THERE ARE NO INTERMEDIARIES (Booking.com and Expedia) to whom we need to pay EXTRA CHARGES for your bookings. Compare our prices with those of Booking.com and Expedia in real-time. You will have proof immediately that we are telling the truth: see with your own eyes that the best rate can only be booked here ! If you prefer, you can phone us on +39 0572 70378 or send a request by writing HERE. We are always available to answer any question about your holiday in Tuscany or about the city of Montecatini Terme. Unlimited Wi-Fi throughout your stay (both in your room and in all the facility) and an Internet Point with a 24” screen to surf the web in greater comfort. When you leave we can hold your luggage in deposit until the evening. The reservation can be canceled or changed at no cost until 12.00 a.m. 1 day prior to arrival.